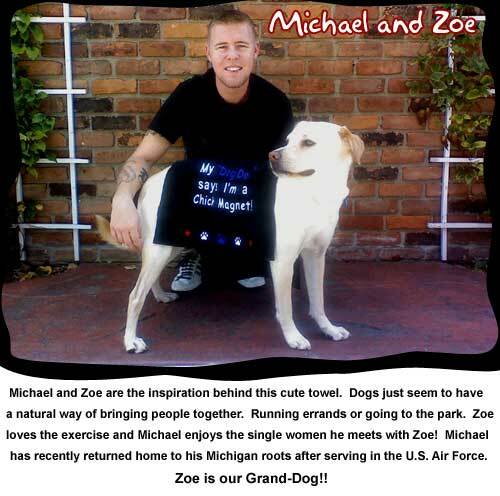 Upscale Apparel and Unique Products for Dog, Cat & Horse Lovers of ALL Ages - ThreeDogZLLC.com - Clean Pawz Embroidered Towel - My "Dog Dad" says I'm a Chick Magnet! 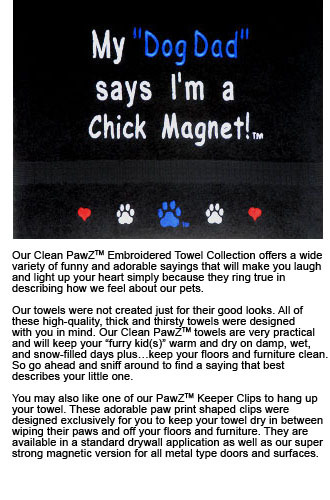 Home > Gifts Under 30 > Clean Pawz "Chick Magnet" Embroidered Towel for Your "Furry Kid(s)"
Dog Dads, this adorable towel is too cute to pass up! Hang up your Clean PawZ™ Embroidered Towel with one of our exclusive PawZ Keeper™ Towel Clips! Watch the video to see how super strong our magnetic clip really is!